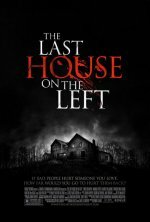 The Last House on the Left release date was Friday, March 13, 2009. Masters of horror Wes Craven and Sean Cunningham revisit their landmark film that launched Craven's directing career and influenced decades of horror films to follow: "The Last House on the Left". Bringing one of the most notorious thrillers of all time to a new generation, they produce the story that explores how far two ordinary people will go to exact revenge on the sociopaths who harmed their child. The night she arrives at the remote Collingwood lakehouse, Mari (Sara Paxton) and her friend are kidnapped by a prison escapee and his crew. Terrified and left for dead, Mari's only hope is to make it back to parents John and Emma (Tony Goldwyn and Monica Potter). Unfortunately, her attackers unknowingly seek shelter at the one place she could be safe. And when her family learns the horrifying story, they will make three strangers curse the day they came to "The Last House on the Left". Remake of Wes Craven's 1972 film.